बरिष्ठ फुटबल क्लबमे उपस्थिति आ खेलैत काल कएल गेल गोल (गोलके घरेलु लिगमे कएल गेल गनल जाइत) नवीनतम जानकारी १९ मे २०१८. Tweedale, Alistair (17 September 2014). "Modest Modric Madrid's Superstar in the Shadows". WhoScored.Com. Retrieved 16 June 2018. "It is fair to say with Xavi's decline Modric is now ahead of him in the pecking order, and he, Kroos, Cesc Fàbregas and Andrea Pirlo are now arguably the best technical central midfielders on the planet at present, and some might even say that Modric is, or could soon be, leading the pack." Marcotti, Gabriele (14 November 2016). "Real Madrid star Luka Modric is ranked as the best central midfielder". ESPN FC. Retrieved 16 June 2018. Bidwell, Nick (11 March 2017). "Europe's best midfielder? Luka Modric biography". World Soccer. Retrieved 16 June 2018. Ronay, Barney (12 May 2017). "All hail Luka Modric, the maestro who makes Real Madrid's superstars tick". The Guardian. Retrieved 16 June 2018. Madu, Zito (3 June 2017). "Luka Modrić was the most important player in Real Madrid's run to back-to-back Champions League titles". SB Nation. Retrieved 16 June 2018. Buskulic, Ante; Tironi, Hrvoje Tironi. (18 November 2017). "How Luka Modric went from rejected youth player to the best midfielder in the world". Goal.com. Retrieved 16 June 2018. Burton, Chris. (6 October 2017). "Luka Modric one of the best midfielder ever". Goal.com. Retrieved 16 June 2018. "Croatian playmaker Modric is yet to earn similar acclaim, amid a Cristiano Ronaldo and Lionel Messi duopoly of top individual awards, but his undoubted quality is not lost on those in Madrid and around the world." Abayomi, Tosin (21 June 2018). "Modric score stunner against Argentina". Pulse Nigeria. Retrieved 1 July 2018. "Luka Modrić is one of the greatest midfielders in the history of football, and deserves to be treated as such." Brown, Euan (22 June 2018). "Luka Modric: It's time to give him a seat at the elite table". UK Blasting News. Retrieved 1 July 2018. "It's about time [Luka Modric] was recognised as one of the game's all-time greats". Grim, David (22 November 2011). "The 10 Most Important Croatian Soccer Players of All Time". Bleacher Report. Retrieved 1 July 2018. Moallim, Mohamed (29 December 2017). "Luka Modric is the best Croatian player in history". Squawka. Retrieved 1 July 2018. "There is no way of looking at this in which he (Modric) doesn’t deserve the title as the best [Croatian] in history". Douglas, Steve (29 June 2018). "Modric the best Croatian player ever". The Fresno Bee. 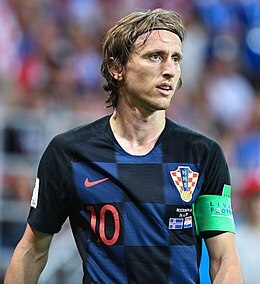 "Croatia midfielder Ivan Rakitic says teammate Luka Modric plays football "from a different planet" and is the best to have ever played for their national team". Associated Press (29 June 2018). "Modric From 'Different Planet', Says Rakitic". The New York Times. Retrieved 29 June 2018. "The technically gifted Prosinecki has long been seen as Croatia's all-time best player, but even he has recently said Modric surpasses him... "If Robert Prosinecki said that, it has to be true because nobody knows about football more than Prosinecki. And I would agree with him completely," Rakitic said. "Not only that Luka is the best player ever, but he is a great person, a leader and we are following him". ↑ Hugman, Barry J., सं (2010). The PFA Footballers' Who's Who 2010–11. Mainstream Publishing. प॰ 290. आइएसबिएन 978-1-84596-601-0. ↑ "Lȗka", Hrvatski jezični portal (shमे), अभिगमन तिथि १७ मार्च २०१८, "Lȗka"
↑ "mȍdar", Hrvatski jezični portal (shमे), अभिगमन तिथि १७ मार्च २०१८, "Módrić"